When it comes to the interior of your home or business, drywall is a big component. It is especially important if you own a business to have quality drywall, as the appearance of your business can tell your customers a lot about you. If the drywall looks unfinished, contains lots of cracks, or is uneven, your business will appear unorganized or even unprofessional. Not only will it give off a bad vibe to customers or guests that visit your business or home, but poor quality or flaking drywall can affect your mood as well. It is much nicer to have clean, even walls in your home. Being able to see how nice your home looks will make you feel good about yourself. To convey a confident, successful message to all who visit, invest in drywall repair services from Wyman Painting. We can help you keep your Omaha home’s interior in top condition. 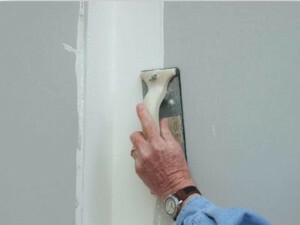 Repairing your drywall, much like layering on a fresh coat of paint, will give your home or business a new life. Smooth, even walls make any home look more stylish and can give any business storefront that edge that it needs. If you are not one for DIY projects, then Wyman Painting can help you out. Our Patch and match plaster services will make your ceilings and walls look like new again, giving a fresh look to your whole home. While patching is a relatively simple process, the most difficult part of the repair is getting a close or exact match to the existing texture on your walls. Our professional and artistically skilled team can make any repair blend smoothly with the rest of your walls. Our xperience in the field makes all the difference. There are a few common problems that can arise when it comes to drywall. If the drywall was not sanded properly, it may be uneven. Drywall that is uneven needs to be patched to maintain an even wall. Another problem that can develop in with drywall is drywall pops. This occurs when the nails beneath the nails underneath the surface of the drywall pop through the finish. Overcutting drywall can result in large gaps around outlets or switch plates. Other common problems with drywall include bubbled tape (when the tape is not properly embedded in the compound), dents and nail holes (typical examples of everyday wear and tear), battered corners, cracks, torn drywall, and water damage. No matter what the problem is with your drywall, Wyman Painting’s professional repair team can help you fix it. As reputable Omaha Drywall repair service providers, we always arrive to your home or business prepared and ready to work. We believe in giving you the most we can for your money. We’re professional and friendly, and we’ve built our reputation on hard work, exceptional drywall repairs and reasonable prices. We will work with you to decide on a solution that fits both your needs and your budget. “Customers return to us for one reason. We do great work,” notes Owner Chris Wyman. Call him direct (402) 319-3956. 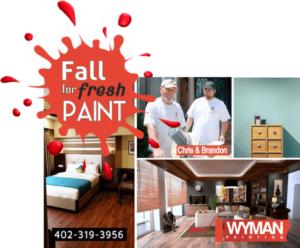 Wyman Painting™ is one of the best Omaha drywall repair services. If you have a home or business in the Omaha area in need of drywall repair, contact Wyman Painting today.